Let me make this 4th of July easier for you and plan your main meal! Whether you need to plan for two or 20 people, this meal idea is adaptable, simple, healthy, and mouthwatering. I guarantee everyone with LOVE it… even those picky little ones! What’s on the menu? You’re about to find out. These Chili Chicken Skewers are ALWAYS a favorite! The combintation of ceyenne pepper and balsamic vinegar makes these skewers slightly spicy, tangy, juicy, and just plain enjoyable. You’ll LOVE them! There are few things that scream ‘summer’ than fresh Fire Grilled Corn-on-the-Cob. 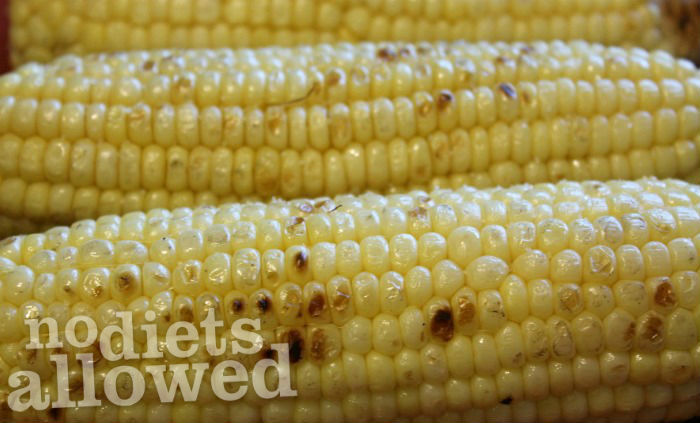 The natural sweetness of the corn is amplified by the coconut oil and sea salt. Yes… this Balsamic Quinoa Salad also includes balsamic vinegar BUT the taste, texture, and combination of flavors are distinctly different than the skewers. You won’t be getting a balsamic overload… promise. Also, you’ll be saving money on limiting the amount of ingredients you’ll need to purchase. BUT if you don’t like balsamic vinegar, you can always substitute with either cider or red wine vinegar or you can just omit and use extra lime juice. Fresh fruit salad is an absolute must for your 4th of July feast! This side dish goes perfectly with the other choices above. Whenever I bring this salad to an event, it’s usually the first thing to disappear on the table. AND since we need a little something red, white and blue and sweet to finish off this amazing meal… check out my recent post on my top 10 favorite 4th of July food ideas. I’m sure you’ll find a couple that will catch your eye. Happy Independence Day to my fellow Americans! Please be safe and enjoy the time away from work and spent with family and friends. Much love to all my NDA readers! What did you enjoy about the meal? What was your family or friend’s favorite part? Which red, white, and blue idea did you make? Don’t forget the brauts, Flamin Hot Cheetos and Dr Pepper. Jeremy! I think you need to review some of my previous posts. Ha ha… I’ll work on healthy substitutes for those things.